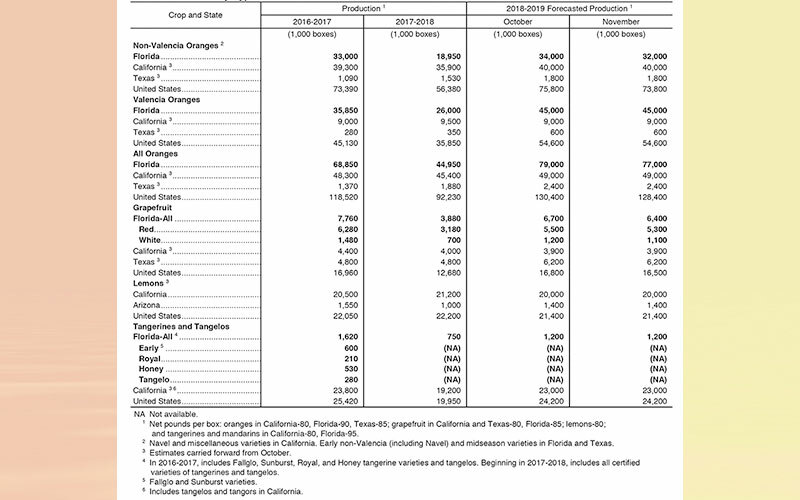 The 2018-2019 Florida all orange forecast released by the USDA Agricultural Statistics Board is lowered to 77.0 million boxes, down 2.00 million boxes from the October forecast. The 2018-2019 Florida all orange forecast released today by the USDA Agricultural Statistics Board is lowered to 77.0 million boxes, down 2.00 million boxes from the October forecast. If realized, this forecast will be 71 percent more than last season’s final production. The forecast consists of 32.0 million boxes of the non-Valencia oranges (early, midseason, and Navel varieties) and 45.0 million boxes of the Valencia oranges. Regression data used are from the 2008-2009 through 2016-2017 seasons. All references to “average”, “minimum”, and “maximum” refer to those 9 seasons unless noted. The hurricane affected 2017-2018 season is excluded from the regressions.